While most people you talk to are spending their time figuring out ways to reduce their fat consumption, I on the other hand have been exploring ways to increase it. What you might not realize is just how important getting enough of the right kinds of fat are for your hormones, your fertility, and having a healthy pregnancy. The first thing to consider is that your body needs cholesterol to make hormones. In a healthy menstrual cycle you would expect to see a balance of estrogen and progesterone, but in order for your body to produce these hormones in sufficient amounts you need to have enough fat in your diet. Not only is fat important for hormone production, but without sufficient levels of fat you run the risk of being deficient in a number of key fat soluble Vitamins such as Vitamins A, D & K. Vitamin A plays an important role in the health of your corpus luteum, which, if you’re not really sure what that is, is a temporary endocrine gland on your ovary that forms after ovulation, and is responsible for the vast majority of your progesterone production. Saturated fat contains cholesterol, and your cholesterol is what your hormones are made of. It seems like a fairly strait forward concept, but if your hormones are out of whack or if you’re having a difficult time conceiving your doctor may not think to make sure you’re getting enough cholesterol from dietary sources; that would just make too much sense. Instead, your doctor might suggest an Intralipid IV to increase your fatty acid concentration. Intralipid IVs contain a combination of the following: soybean oil, cotton seed oil, egg yolks, safflower oil, MCT oil, olive oil, fish oil, etc., and similarly to getting a B12 shot, Intralipid infusions increase your essential fatty acid concentration right away, and are commonly used in situations when people aren’t able to get their nutrition from eating food (i.e. premature babies). But before you run out and get an injection of a questionable cocktail of soybean oil and egg yolks, you might want to consider…(gasp) just eating more fat. You can do this by increasing the amount of stable saturated fats in your diet, increasing your intake of omega 3 fatty acids, and decreasing the amount of inflammatory omega 6 oils you eat (i.e. vegetable oils such as canola, soybean oil, etc. ), as a way to naturally improve your hormone profile in a much less invasive way. I’m not suggesting you start eating butter for breakfast or anything, but given that we’ve pretty much all been taught to avoid fat, I recognize that it might not be easy for you to just eat the fat. An easy first step is familiarizing yourself with your options when it comes to stable saturated fats. This includes butter, coconut oil, ghee, pastured lard, duck fat, and full fat dairy products among others. Every time you sit down to eat something you want to keep in mind to aim for a balance of fat, protein and carbohydrates. Those are the 3 macro-nutrients. Everything you put into your mouth falls into one of those 3 categories. As much as we’ve been told that fat is bad for us, fat is actually necessary, and extremely important especially when you’re trying to conceive. In fact, if you want to decrease your chances of conceiving one of the first things you can do is to cut out full fat dairy products. Women who eat low fat dairy products are shown to ovulate less and have higher rates of infertility. I’m not saying that everyone can consume dairy products without incident, but what I am saying is that making a point of eating a low fat diet is extremely counter productive when you’re trying to conceive. 1. Ditch the canola oil and cook with coconut oil or butter instead – this one should speak for itself. The first thing to do is to swap out the vegetable oils with stable saturated fats for cooking. Vegetable oils like canola, soybean, and safflower oils are extremely unstable when heated. You’ll notice that they have what’s called a low smoke point, and that quite literally means that the oil starts smoking quite quickly after you start heating it up. When you see the smoke and smell that nasty chemical burn scent it means the oil has been damaged. When you regularly consume damaged oils it leads to inflammation in the body, and it contributes to hormone imbalance. When you cook with stable saturated fats, they are not damaged by heat, and your body can use the cholesterol in these fats to make hormones! Win Win! 2. Take cod liver oil – Cod liver oil is a great source of omega 3 Fatty Acids which are needed to balance out omega 6 Fats. Cod liver oil also contains Vitamin A, which your body needs to make hormones, and Vitamin D which is important to get enough of especially in the winter months. 3. Leave the skin on your meat…and eat it – Yes I said it. When you cook chicken, duck, or any meats really, don’t go for the skinless, boneless option. When sourcing meat, you want to make get the best quality your budget allows for (i.e. local, grass fed, pastured, hormone free, antibiotic free, etc. ), and you want to leave the skin on when you eat it. This ensures that you’re getting more of a balance of protein and fat at each meal. 4. Saute your vegetables in butter or coconut oil – One quick and easy way to increase the amount of healthy saturated fats in your diet is to go old school and saute your veggies in butter (coconut oil, ghee, duck fat, lard, etc.). One fantastic side benefit of cooking with real fat is that your food will taste amazing. Don’t like peas and beans? Tell me how you feel about them after slathering them in butter. 5. Make your own salad dressing – The quickest and simplest salad dressing I know how to make consists of 3 ingredients: olive oil, red wine vinegar, and fresh (or dried) oregano. If you like, you can add a teaspoon of honey for flavor, and voila! Yummy home made salad dressing with a healthy fat profile. One thing to keep in mind is that although olive oil is a healthy option, it’s not the best oil to cook with. You’ll get the maximum benefits of olive oil when you consume it unheated, or minimally heated. 6. Eat fish – Eating fish is a great way to incorporate omega 3 fatty acids into your diet. Omega 3 oils are anti-inflammatory, and extremely important to get enough of when you’re trying to conceive and throughout pregnancy. 7. Go for the full fat option – Say no to “low fat” or “no fat” options. Stay away from anything that says 0% fat. It’s a trap! Do you know what gives food its flavour? You guessed it! Fat. When you take the fat out of food it tastes like crap. In order to make it taste good again guess what you need to add to it? I know you know I’m going with this by now. You guessed it! Sugar. If you take a look at products that say 0% fat you’ll notice that they need to up the sugar content in order to compensate for their lack of flavour. Fat doesn’t make you fat, but excessive sugar consumption does. Choosing a full fat plain yogurt, and adding some fruits and a little honey (maple syrup, coconut sugar, etc. ), is a much better option than going for the super sweet low fat “strawberry” yogurt. With that in mind you’ll want to go for whole milk, full fat yogurt, real cheese (if you tolerate dairy), and skip anything that says 0% fat as a rule. 8. Eat the yolks – don’t throw away your egg yolks. Eat them! Not only do the yolks contain essential fatty acids, but the yolks are packed with important nutrients like Vitamin A, folate, choline, B12, selenium, zinc…and the list goes on. 9. Have some bacon – If you’re able to source some pasture raised, hormone free bacon without nitrites or any of the other nasty chemical compounds you typically find in store bought meat, now’s the time! If you haven’t had real bacon in awhile you may have forgotten just how delicious it is. You’ll thank me later. If you’re not used to eating the fat it can feel pretty weird to add it back into your diet. It might make you a little nervous since we’ve all been indoctrinated to believe that fat is bad for us (and that will kill us if we eat too much of it), but the first thing you’ll notice is how much flavour fat adds to your food. Everyone you cook for will be falling over themselves to figure out why everything tastes so good. And you may find yourself adding less salt (and less sugar) to your food because you just don’t need as much anymore to make it taste good. 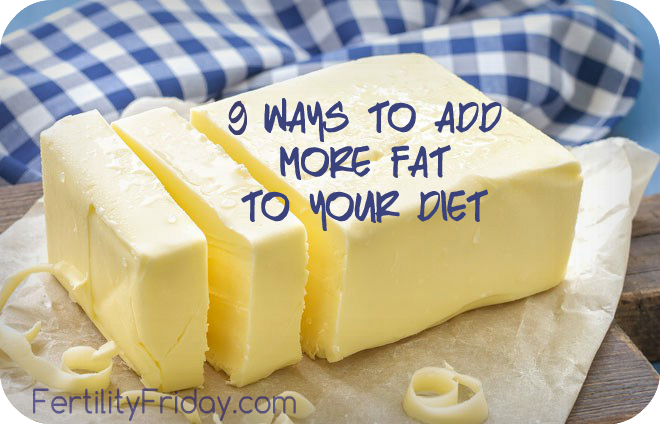 These are definitely not the only ways that you can incorporate more fat into your diet, so now I want to hear from you! What are some ways that you’ve incorporated fat into your diet? Please share your thoughts in the comments below!